Aside from their reproductive organs, what are the differences between a male and a female dog? Some people say female dogs behave better and that male dogs are better guards. Is this theory true? If you have the same question, you’re in the right place. 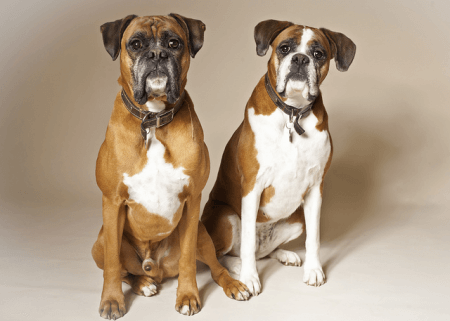 This article will explore the difference between male and female dogs. Male dogs are formed when the puppies in the womb are exposed to a testosterone surge. In general, they are large, heavy, and have chunky heads when they reach adulthood. In hairy breeds, males have noticeable, luxurious, ornamented coats. Their reproductive parts are also very apparent. If you do not plan to breed your dogs, experts suggest that male dogs be neutered (a process where the dog’s testicles are removed to prevent reproduction) as early as possible. Unneutered dogs are easily distracted by females nearby and may have the tendency to roam and be aggressive. They may also show dominance to smaller dogs and even to his owner. Neutered dogs are a lot calmer and are less likely to roam. Male dogs are preferred by breeders for trailing and tracking as they are scent-oriented. They are also considered to be more profitable because they can breed continuously (unless neutered). When it comes to temperament, male dogs have a stable mood but can be aggressive. They can be goofy and affectionate to their owners. They like to be pampered and to pamper their human friends. Around children, they can be playful but they have the tendency to be rough. All these traits, however, are a general observation and really depend on how you train your dogs. It may also depend on the specific breed of dog. On the other hand, female dogs are formed in the womb when the puppies are not exposed to a testosterone surge. When they become adults, their bodies show refined features and their heads are small and delicate. Their backs are longer, which aids them when they carry puppies. Female dogs mature fast. They have the ability to bear puppies once a year. Female dogs go through the “heat cycle” for an average of three weeks two times annually. During this time, they produce a vaginal secretion which lures male dogs. Constant cleaning is necessary since they bleed and may leave stains on carpets and furniture. If you do not plan to breed your female dogs, you can have them spayed, a process where their ovaries are removed to avoid accidental and unwanted pregnancies. Spaying can be quite costly especially if it is done in a private veterinary clinic. Spaying is known to help improve their behavior; they become less moody. Female dogs are visually oriented and have high cognitive abilities, according to experts. They have the ability to notice visual changes which probably roots from their natural instinct to look after their young. When it comes to behavior, female dogs are almost similar to cats. They are independent, moody, and only act when they want to. They also have the tendency to be manipulative, territorial, and dominant. In general, female dogs are focused but they can be hard to train especially when they are in heat. They are great around children as they are innately loving and protective of young creatures – even the ones from different species. What, then, is the difference between male and female dogs? Male dogs are formed in the womb when the puppies are exposed to a testosterone surge. Those that are not exposed to the surge become female dogs. The most obvious difference between male and female dogs is that males are generally bigger, stockier, and bulkier than female dogs when they reach adulthood. In hairy breeds, males have a more luxurious coat than the females. Female dogs tend to have delicate and refined features. They have smaller heads than males and their backs are long. They go through a “heat cycle” where they bleed. Many people say the temperament of the dogs is dependent on how they are raised, while some people also say it’s dependent on their breed. But there is really no black and white distinction between a male dog’s behavior and a female dog’s behavior. In general, however, male dogs are playful around children, stable, affectionate, and can be aggressive. Females, on the other hand, are more gentle around children, as they have the innate ability to nurture the young. They also have the tendency to be moody, manipulative, independent and territorial. It is important to note, however, that spaying (for females) and neutering (for males) dogs can significantly improve their behavior. Spaying can be more expensive than neutering. Experts say female dogs are visually oriented while male dogs are scent-oriented. Serious breeders also prefer male dogs because they can breed continuously, while female dogs can only bear puppies once a year.